Th2 responses are clearly involved in the pathogenesis of atopic disease. Thus, understanding the factors responsible for Th2 sensitization at sites of allergen exposure, such as airway and skin, is crucial for directing therapeutic or preventive strategies. Contrary to other models of Th2 sensitization to proteins, we have reported that Th2 responses induced by epicutaneous exposure to OVA are IL-4 independent. Combined deficiency of both IL-4 and IL-13 signaling did prevent Th2 generation, suggesting that IL-13 was mediating these IL-4-independent responses. It was not clear, however, whether IL-13 was simply replacing the need for IL-4 in genetically deficient mice or if IL-13 played a unique role. In the present study, we show that Th2 responses induced by epicutaneous OVA exposure (including lung inflammatory responses after inhaled Ag challenge, OVA-specific IgG1, and draining lymph node IL-5 production) are impaired in IL-13-deficient (IL-13−/−) mice compared with wild type. In contrast, i.p. sensitization of IL-13−/− mice resulted in responses equivalent to wild type. Generation of contact hypersensitivity to dinitrofluorobenzene, which involves Th1 and CD8+ effector cells, was also intact in IL-13−/− mice. Taken together, the data indicate that IL-13 is the major inducer of Th2 generation in the cutaneous microenvironment, being required independently of IL-4. This fact, in combination with the known abundance of IL-13 in atopic dermatitis skin lesions, emphasizes the potentially important role of the skin as a site for Th2 sensitization to environmental allergens, particularly in atopic individuals. It is clear that Th2-type immune responses are involved in the pathogenesis of atopic disease. The Th2 cytokines IL-4, IL-5, and IL-13 are abundant at sites of allergic inflammation, whether the skin or airway (1, 2, 3, 4, 5, 6), and have been shown to mediate the characteristic inflammatory changes associated with allergic disease, including tissue eosinophilia, mucus hypersecretion in the lung, and high serum IgE levels (7, 8, 9, 10, 11, 12). Two of these Th2 cytokines, IL-4 and IL-13, are structurally related molecules that share several biological functions. These include suppression of inflammatory cytokine production by macrophages, up-regulation of MHC class II molecules on monocyte/macrophages, and induction of VCAM expression by endothelial cells (reviewed in Ref. 13 ;14, 15, 16). The similar effects of these two cytokines can be explained by common usage of the IL-4Rα chain in both IL-4 and IL-13 receptor complexes (17, 18, 19). Stimulation through this receptor component leads to phosphorylation of the intracellular signaling molecule STAT6, which has been shown to be a crucial factor in Th2 generation (20, 21, 22, 23). Despite this overlap in function, however, IL-4 and IL-13 also exhibit distinct effects. For example, IL-4 directs naive CD4 T cells to differentiate into Th2-type effector cells, a function which has not been demonstrated for IL-13 (24, 25, 26). It is the generation of Th2 responses to commonly encountered environmental Ags that distinguishes atopic individuals from the rest of the population. Thus, understanding the factors involved in this initial Th2 sensitization at sites of natural allergen exposure, such as the lung and skin, is crucial for directing therapeutic or preventive strategies. Despite the significant role for IL-4 in directing Th2 differentiation, IL-4-independent Th2 responses have also been identified. These reports have primarily been in live pathogen models of Th2 inflammation, using mice genetically deficient in IL-4 production (27, 28, 29, 30, 31, 32, 33). Comparison of responses generated in mice lacking IL-4, IL-4Rα, STAT6, IL-13, or both IL-4 and IL-13 have revealed that IL-13 is crucial for Th2 generation in many of these instances (31, 32, 33). For example, IL-4Rα-deficient (IL-4Rα−/−) mice infected with the nematode Nippostrongylus brasiliensis showed a greater impairment in Th2 responses, which are required for expulsion of these worms, than did IL-4-deficient (IL-4−/−) mice, implicating IL-13 as the critical factor in these responses (31). Consistent with these results, mice lacking IL-13 alone are also deficient in their ability to clear a N. brasiliensis infection (32). In addition to the examples in live pathogen models, our laboratory has also reported an IL-4-independent Th2 response to soluble protein Ag in the cutaneous microenvironment in a mouse model of allergic sensitization (34). We showed that IL-4−/− mice epicutaneously (e.c. )3 sensitized to OVA were able to generate Th2 responses equivalent to those seen in wild-type (WT) mice. This included lung inflammatory responses after inhaled Ag challenge characterized by eosinophilia, mucus hypersecretion, and production of the Th2 cytokines IL-5 and IL-13. In contrast, Th2 responses generated in WT mice by initial sensitization with inhaled OVA were no longer seen in IL-4−/− mice. Thus, the IL-4-independent generation of Th2 inflammatory responses to OVA was a particular characteristic of priming through the skin. Similar to the situation with nematode infections, these IL-4-independent Th2 responses induced by e.c. exposure to OVA appeared to involve IL-13. Specifically, in contrast with mice deficient in IL-4 alone, mice functionally deficient in both IL-4 and IL-13 signaling failed to generate Th2 responses after e.c. exposure to OVA, as exemplified by a lack of both eosinophilia and mucus production in the lung after inhaled Ag challenge (34). This effect was seen both in STAT6−/− mice and in IL-4−/− mice depleted of IL-13 with a soluble antagonist. Thus, it appeared that the likely candidate for inducing Th2 generation in e.c. sensitized IL-4−/− mice was IL-13. Still unanswered, however, was whether IL-13 was simply able to replace the need for IL-4 in these genetically deficient mice, consistent with previously described redundant roles for these two cytokines, or whether IL-13 played a unique and independent role in Th2 generation. In other words, is IL-13 required, or simply sufficient, for Th2 generation in the cutaneous microenvironment? Furthermore, because others have shown that IL-13 can directly induce airway eosinophilia (11, 35), the possibility remained that decreased airway eosinophilia in mice deficient in both IL-4 and IL-13 in our previous studies was simply due to a block of eosinophil recruitment to the lung, not a decrease in Th2 priming. To address these questions in the present study, we investigated the effect of IL-13 deficiency alone on generation of Th2 responses after e.c. exposure to soluble protein. We show that IL-13-deficient (IL-13−/−) mice are impaired in their ability to generate Th2 responses after e.c. exposure to OVA, indicating an independent role for IL-13 in Th2 activation through the skin. Similar defects were also seen when WT mice were administered a soluble IL-13 antagonist, arguing against an inherent defect in the ability of the IL-13−/− mice to generate effective Th2 responses. In contrast with the situation in mice deficient in both IL-4 and IL-13, e.c. sensitized IL-13−/− mice did not demonstrate a switch from a Th2 to a Th1 response, but rather showed an overall deficit in priming. Furthermore, as others have reported (32, 36), i.p. sensitization of IL-13−/− mice in the present study did result in OVA-specific Ab production equivalent to that seen in WT mice as well as significant lung inflammatory responses. IL-13−/− mice were also able to mount a vigorous contact hypersensitivity (CHS) response to dinitrofluorobenzene (DNFB), demonstrating that they could be sensitized to a hapten applied to their skin. Thus, it appeared that IL-13 was required specifically for generation of Th2 responses to e.c. encountered Ag. Taken together, the data indicate that IL-13 is the major inducer of Th2 generation in the cutaneous microenvironment, being required independently of IL-4. This fact, in combination with the known abundance of IL-13 in atopic dermatitis skin lesions (2, 3, 37), emphasizes the potentially important role of the skin as a site for Th2 sensitization to environmental allergens, particularly in atopic individuals. C57BL/6J mice were purchased from The Jackson Laboratory (Bar Harbor, ME). IL-4−/− mice were obtained from The Jackson Laboratory (C57BL/6J-Il4tm2Nnt) and were subsequently bred in our facilities. STAT6−/− mice were provided by J. Ihle (St. Jude’s Research Center, Memphis, TN). IL-13−/− mice were provided by A.N.J.M. Both STAT6−/− and IL-13−/− mice were on a B6/129 background and were bred and maintained in our facilities. B6/129 F2 mice (progeny of B6/129 F1 mice purchased from The Jackson Laboratory and bred in our facilities) were used as controls for these strains. Female mice, 8–12 wk of age, were used in all experiments. Mice were e.c. exposed on shaved back skin to OVA (100 μg) in PBS (100 μl), or to PBS alone, on day 0 as previously described (34). Beginning on day 14 after e.c. sensitization, mice were challenged with inhaled (i.n.) OVA over a 6-day period and then were sacrificed for assessment of lung inflammation, as previously described (34). Briefly, mice were administered 50 μl of OVA in PBS (0.5 mg/ml) by intranasal droplet on days 14, 15, 18, and 19, and were sacrificed on day 21. Bronchoalveolar lavage (BAL) was performed and cells recovered were enumerated. Differential cell counts were based on morphology and staining characteristics of 200 cells per sample. H&E-stained lung sections were examined and scored in a blinded fashion for the amount of inflammation present using a subjective scale based on the numbers of foci and density of inflammation, including peribronchiolar, perivascular, and interstitial infiltrates. To block IL-13 activity in vivo, a soluble IL-13 receptor α2-Fc fusion protein (IL-13Rα2) was used (kindly provided by D. Donaldson at Wyeth, Respiratory Disease, Cambridge, MA). IL-13Rα2 was prepared as described previously (38). WT C57BL/6 mice were injected i.p. with 200 μg of either IL-13Rα2 or ctrl-Fc (murine IgG2a) in 200 μl of PBS on days −1, 1, and 3 of the e.c. sensitization protocol described above. In other experiments, recombinant murine IL-13 (R&D Systems, Minneapolis, MN; 0.005–5 μg in 100 μl of PBS) or PBS alone was administered to IL-13−/− mice s.c. in the area of e.c. OVA exposure on days 0 and 1. Serum was collected at the time of sacrifice on day 21. OVA-specific IgG1 and IgG2a were measured by ELISA as previously described (34). Skin-draining (axillary) LNs were harvested on day 4 after e.c. exposure to OVA. Cells from two to three mice per group were pooled and then cultured (4 × 106/ml) with APCs (syngeneic T-depleted splenocytes; 4 × 106/ml) and OVA (100 μg/ml) in Click’s/5% FCS at 37°C for 48 h. Cytokines in culture supernatants were detected using commercially available ELISA kits (IFN-γ, IL-4, and IL-5, Endogen, Woburn, MA; IL-13, R&D Systems). Mice were sensitized on day 0 by e.c. application to razor-shaved abdominal skin of 25 μl of 0.5% DNFB in a mixture of acetone:olive oil (4:1). On day 5, after measuring baseline ear thickness with an engineer’s micrometer, mice were challenged by applying 10 μl of 0.2% DNFB in acetone:olive oil to each side of each ear. Ears were remeasured at 6–72 h after challenge; data are expressed as the peak ear swelling response above baseline (i.e., ear thickness 24 h after challenge minus ear thickness immediately before challenge) ± SEM. Statistical significance was determined using an unpaired Student’s t test. We have previously reported that IL-4−/− mice are able to generate Th2 responses equivalent to those of WT mice after e.c. sensitization to OVA (34). After i.n. Ag challenge, both e.c. 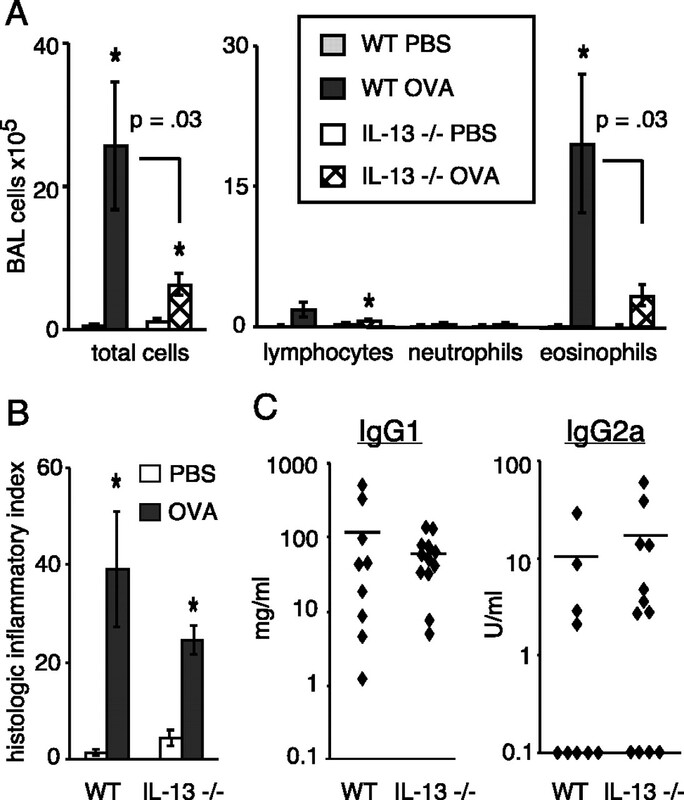 OVA-sensitized WT and IL-4−/− mice develop significant increases in the total number of cells recovered by BAL, along with high numbers of eosinophils, compared with sham immunized mice. Further evidence of Th2 generation in this model are the production of Th2 cytokines (IL-5, IL-13) by lung inflammatory cells after i.n. Ag challenge and the presence of mucus hypersecretion in airways, which is seen in both WT and IL-4−/− mice (34). In contrast, e.c. sensitized STAT6−/− mice, which are unable to respond to either IL-4 or IL-13, demonstrated a significant reduction in Th2 inflammatory responses in the lung after i.n. Ag challenge, with decreased eosinophilia (34) and no mucus production in airways (C. Herrick and K. Bottomly, unpublished observation). Instead, Th1-associated inflammatory responses were seen in STAT6−/− mice, with increases in total BAL cells and neutrophils (34). These differences in the BAL inflammatory response seen in e.c. sensitized IL-4−/− and STAT6−/− mice are summarized in Fig. 1⇓. Comparison of airway inflammation and Ab responses in e.c. sensitized IL-4−/− and STAT6−/− mice. Mice were e.c. exposed to OVA and then challenged 2 wk later with inhaled OVA. After sacrifice, BAL was performed and inflammatory cells recovered from individual mice were enumerated. OVA-specific Abs were measured in serum. All data are reported as mean ± SEM from individual mice. A, Data are pooled from three experiments (WT, n = 11; IL-4−/−, n = 13). Data from two of these experiments were previously published in a different format (34 ). B, Data are pooled from two experiments (WT, n = 5; STAT6−/−, n = 7). BAL data were previously published in a different format (34 ). Statistical significance was determined by unpaired Student’s t test. n.d., None detected. A different outcome was seen, however, when OVA-specific Ab responses were examined in these mice. As we have reported previously, IL-4−/− mice did show significantly decreased anti-OVA IgG1 and high levels of anti-OVA IgG2a after e.c. sensitization, compared with those of WT mice (34) (Fig. 1⇑A). Thus, despite the generation of Th2 effector cell responses capable of mediating allergic airway inflammation in e.c. sensitized IL-4−/− mice, the Ab isotype profile in these mice reflected a change from a Th2- to a Th1-associated pattern. The added inability to respond to IL-13, as exemplified in STAT6−/− mice, did not change this Th1-associated isotype profile (Fig. 1⇑B). These data indicate that although IL-13 could mediate Th2 generation in IL-4−/− mice, it could not duplicate the role of IL-4 in isotype class switching to IgG1 or suppression of Th1-mediated IgG2a production. Taken together, the data support a model whereby individual Th2 cytokines are responsible for distinct Th2-associated effector functions. Th2-mediated airway inflammation is primarily reliant upon IL-5 and IL-13, whereas the Th2-associated Ab isotype profile of high IgG1 and low IgG2a is mainly due to the effects of IL-4. It was not clear from our previous studies whether IL-13 was simply able to replace the need for IL-4 in the genetically IL-4-deficient mice or whether IL-13 played a unique and independent role in Th2 generation in this model. Furthermore, others have shown that IL-13 can directly induce airway eosinophilia, either by administration of rIL-13 to the airways or in mice genetically engineered to overexpress IL-13 in the lung (11, 35). Therefore, it remained possible that the decreased airway eosinophilia seen in mice deficient in both IL-4 and IL-13 signaling (STAT6−/− mice) was simply due to a block of eosinophil recruitment to the lung, and not due to a decrease in Th2 priming. To more directly investigate the role of IL-13 in e.c. induced Th2 responses to soluble protein, we exposed WT or IL-13−/− mice e.c. to OVA. As shown in Fig. 2⇓A, induction of airway inflammatory responses in these mice was markedly impaired. Compared with WT mice, IL-13−/− mice not only had fewer eosinophils recovered by BAL (p = 0.04), but they also had a significantly reduced number of lymphocytes (p = 0.03) and total BAL cells (p = 0.04) after i.n. OVA challenge. Histologic examination of lung parenchyma also failed to reveal any inflammation in e.c. sensitized IL-13−/− mice after i.n. challenge with OVA (Fig. 2⇓B), and no periodic acid-Schiff+ staining (indicating mucus secretion) was seen in airways of IL-13−/− mice (data not shown). Notably, the complete lack of lung inflammation in IL-13−/− mice was different from the results obtained in STAT6−/− mice, where only a specific decrease in Th2-associated eosinophilia and mucus hypersecretion was seen, but not a decrease in total BAL cell number (Fig. 1⇑) or lung inflammation (data not shown). This suggested a defect in initial sensitization in the IL-13−/− mice, not simply a switch in the type of response generated, as was seen in the absence of both IL-4 and IL-13 signaling in STAT6−/− mice. These results could be explained by persistence of IL-4 expression in IL-13−/− mice preventing generation of a Th1 response. Lack of lung inflammation and decreased Ab production in e.c. sensitized IL-13−/− mice. WT or IL-13−/− mice were e.c. exposed to OVA in PBS, or to PBS alone, and then were challenged 2 wk later with i.n. OVA. A, Both the total number of cells recovered by BAL and the number of each cell type are shown; mean ± SEM from individual mice. B, Histologic sections of lung were examined and scored for the amount of inflammation. Data are reported as the mean ± SEM from individual mice. Data shown in A and B are from a representative experiment, one of three with similar results (three to five mice per group). C, OVA-specific Abs were measured in serum. Data are pooled from three experiments. Statistical significance was determined by unpaired Student’s t test. To further examine whether the lack of lung inflammation displayed by e.c. OVA-exposed IL-13−/− mice was indeed due to a failure to generate a systemic response after e.c. OVA exposure, serum Ab responses were evaluated. Consistent with a defect in Th2 priming, e.c. OVA-exposed IL-13−/− mice had significantly lower levels of OVA-specific IgG1 (p = 0.03) in serum compared with those of WT mice (Fig. 2⇑C). No OVA-specific IgG2a was detected in serum of either IL-13−/− or WT mice. As with the lung inflammatory response, this finding was different from results obtained in mice deficient in either IL-4 alone or both IL-4 and IL-13 (STAT6−/−), in which elevated IgG2a responses are seen (Fig. 1⇑). Thus, there was not a switch in Ab isotype profile from a Th2- to a Th1-associated pattern in IL-13−/− mice, as was seen in mice deficient in IL-4, but rather there was an overall decrease in OVA-specific Ab production. Taken together, these results suggest that IL-13, unlike IL-4, does not play a major role in suppression of Th1 generation. To confirm that the observed effect on Th2 generation in IL-13−/− mice was due to a defect in initial sensitization after e.c. exposure to OVA, cytokine production by skin-draining LN cells was evaluated. LN cells were isolated 4 days after e.c. OVA exposure and were then restimulated in vitro by culture with OVA. Consistent with generation of Th2 effector cells, restimulation of skin-draining LN cells from e.c. sensitized WT mice resulted in high amounts of IL-5 and IL-13 being detected in culture supernatants (Fig. 3⇓A). When LN cells from e.c. OVA-sensitized IL-13−/− mice were restimulated in culture, however, significantly decreased amounts of IL-5 (p = 0.05) were present in supernatants compared with cultures of WT cells. In contrast, equivalent levels of IFN-γ were detected in cultures of WT and IL-13−/− LN cells (Fig. 3⇓A). Although IL-4 was not detected in either WT or IL-13−/− LN cultures in most cases (three of four experiments), it was present at low levels in both groups in one experiment (31 and 12 pg/ml, respectively). These data are consistent with a decrease in the priming of Th2 effector cells in skin-draining LNs early after e.c. OVA exposure. For comparison, cytokine production by skin-draining LN cells from e.c. OVA-sensitized IL-4−/− mice was also evaluated. As shown in Fig. 3⇓B, high levels of IL-5 and IL-13, equivalent to those in cultures of WT LN, were produced by LN cells from IL-4−/− mice. This is consistent with our previous observation of preservation of e.c. induced Th2 responses in the absence of IL-4 alone. Cytokine production in skin-draining LNs after e.c. OVA exposure. Mice were e.c. exposed to OVA on day 0 and axillary LNs were harvested on day 4. LN cells, pooled from two to three mice per group, were then restimulated in vitro with OVA and cytokines in culture supernatants measured at 48 h. A, Data are reported as mean ± SEM cytokine levels from four separate experiments. Statistical significance was determined by unpaired Student’s t test. B, Data are reported as mean ± SEM of triplicate cultures from a single experiment. Cultures of LN cells from mice exposed to PBS alone had no detectable cytokines. n.d., None detected. Because it has been purported that IL-13−/− mice may have an intrinsic defect in their ability to produce IL-4 (39), it was possible that the failure of IL-13−/− mice to generate Th2 responses after e.c. OVA exposure in the present study might actually reflect a deficiency of both IL-13 and IL-4. This seemed unlikely, given the different outcomes observed in STAT6−/− mice, deficient in both IL-4 and IL-13 signaling (summarized in Fig. 1⇑) compared with IL-13−/− mice (Fig. 2⇑). Nevertheless, we addressed this issue by use of a soluble IL-13 antagonist, consisting of the IL-13Rα2 chain linked to a fragment of the Fc portion of murine IgG2a (38). As shown in Fig. 4⇓A, cultures of skin-draining LN cells from e.c. OVA-sensitized WT mice depleted of IL-13 with the soluble antagonist had significantly reduced levels of IL-5 (p = 0.002) and IL-13 (p < 0.001) compared with those of control-treated mice. This was similar to the results seen with LN cells from IL-13−/− mice (Fig. 3⇑A). 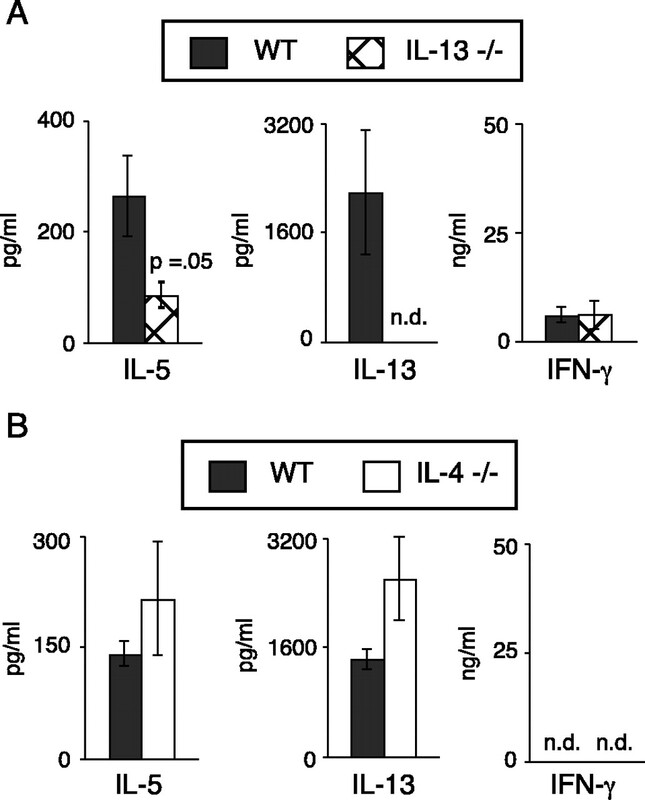 In contrast, there were no differences in the levels of IFN-γ or IL-4 produced by LN cells from WT mice depleted of IL-13 compared with those treated with control (Fig. 4⇓A). Administration of exogenous IL-13 to IL-13−/− mice during e.c. OVA exposure enhanced the production of both IL-4 and IL-5 by LN cells (Fig. 4⇓B). Furthermore, this effect of IL-13 on both IL-4 and IL-5 production was shown to be dose dependent (Fig. 4⇓C). Of note, the ability of exogenously added IL-13 to restore robust IL-4 production by LN cells from IL-13−/− mice provides further evidence that these mice have no inherent defect in their capacity for IL-4 secretion. Taken together, these data indicate that IL-13 alone is critical for generation of Th2 cells in skin-draining LNs early after e.c. OVA exposure. Effect of IL-13 depletion in WT mice or addition of exogenous IL-13 to IL-13−/− mice on cytokine production in skin-draining LNs after e.c. OVA exposure. Mice were e.c. exposed to OVA on day 0 and axillary LNs were harvested on day 4. LN cells were then restimulated in vitro with OVA and cytokines in culture supernatants measured at 48 h. A, WT C57BL/6 mice were administered a soluble IL-13 antagonist (IL-13Rα2) or control murine IgG2a. Data are reported as mean ± SEM of triplicate cultures from a representative experiment, one of three with similar results. Statistical significance was determined by unpaired Student’s t test. B, IL-13−/− mice were administered exogenous IL-13 (5 μg) or PBS. Data are reported as mean ± SEM cytokine levels from three separate experiments. n.d., None detected. C, IL-13−/− mice were administered various doses of IL-13 (0.005–5 μg). Data are from a single experiment. The data reported above, using a soluble IL-13 antagonist in WT mice, argued against the possibility that our observation of decreased Th2 priming in IL-13−/− mice was due to an inherent IL-4 defect in the mice. 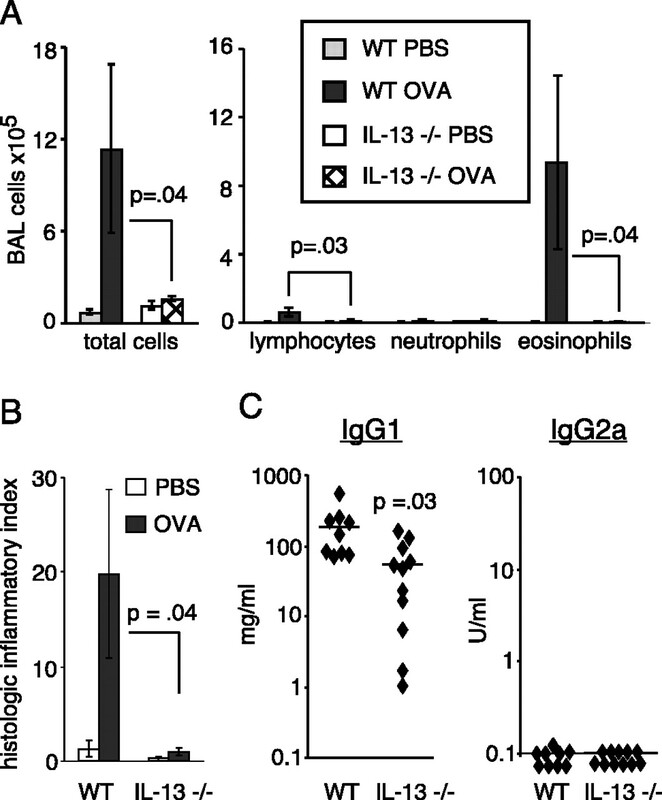 However, to ensure that the IL-13−/− mice maintained their ability to respond to OVA in a more traditional Th2-inducing system, we immunized WT and IL-13−/− mice with OVA i.p. in PBS on day 0, followed two weeks later by challenge with i.n. OVA, as had been done with the e.c. sensitized mice. As shown in Fig. 5⇓A, i.p. 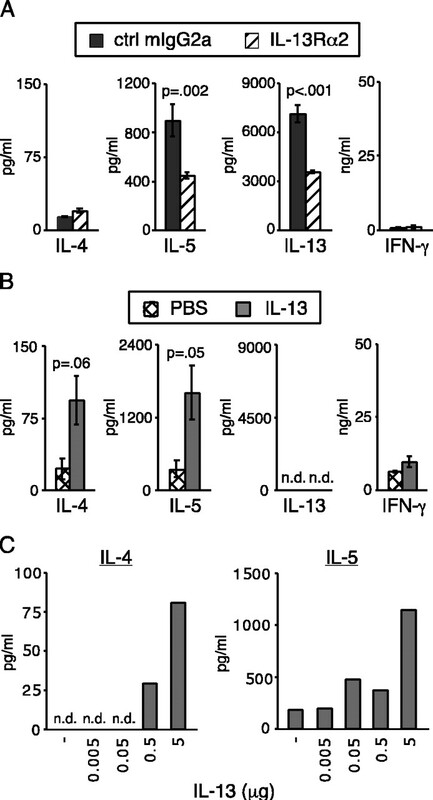 sensitized IL-13−/− mice did show decreased numbers of inflammatory cells in BAL fluid after i.n. OVA challenge, compared with those of WT mice. However, in contrast to e.c. sensitized mice (Fig. 2⇑A), when i.p. OVA-sensitized mice were compared with sham-immunized controls, there were significantly increased numbers of cells recovered by BAL (Fig. 5⇓A). Both lymphocytes and eosinophils were increased, although only the lymphocyte difference was statistically significant. This suggested that the relative decrease in BAL cell numbers in i.p. sensitized IL-13−/− mice, as compared with WT mice, might actually be reflective of a lack of recruitment to the airway, as discussed above. Indeed, examination of histologic sections revealed that inflammatory infiltrates in lungs of i.p. sensitized IL-13−/− mice were equivalent to those of WT mice (Fig. 5⇓B). 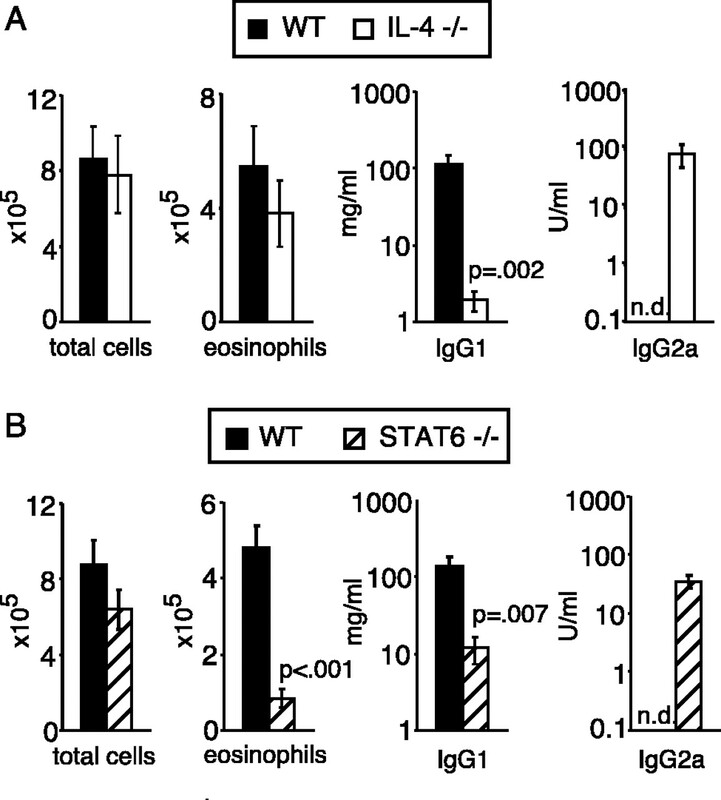 Although the lung infiltrates of IL-13−/− mice contained high numbers of eosinophils, no mucus was present, as indicated by negative periodic acid-Schiff staining (data not shown). Finally, measurement of serum Ab responses in these mice showed that, in contrast with e.c. sensitized IL-13−/− mice, the i.p. sensitized IL-13−/− mice mounted Ab responses equivalent to those of WT, including high levels of OVA-specific IgG1 and IgG2a (Fig. 5⇓C). Taken together, these findings are consistent with those of others who have reported no deficit in Ab production or Th2 inflammatory responses in the lung in i.p. sensitized IL-13−/− mice (32, 36). No deficit in lung inflammation or Ab production in i.p. sensitized IL-13−/− mice. WT or IL-13−/− mice were injected i.p. with OVA in PBS, or PBS alone, and then were challenged 2 wk later with i.n. OVA. A, Both the total number of cells recovered by BAL and the number of each cell type are shown; mean ± SEM from individual mice. B, Histologic sections of lung were examined and scored for the amount of inflammation. Data are reported as the mean ± SEM from individual mice. Data shown in A and B are from a representative experiment, one of two with similar results (five mice per group). ∗, p ≤ 0.03, PBS- vs OVA-sensitized groups. C, OVA-specific Abs were measured in serum. Data are pooled from two experiments. There was no significant difference between WT and IL-13−/− groups (unpaired Student’s t test) in either B or C.
The results presented in this study support the need for IL-13 in the generation of Th2 responses, specifically in the cutaneous microenvironment. To investigate whether this was unique to Th2 activation, rather than a result of an unrecognized defect in the ability of IL-13−/− mice to respond to any Ag presented in the skin, we examined the ability of IL-13−/− mice to respond to the contact sensitizing agent DNFB. CHS to this hapten is known to involve both CD4 Th1 and CD8 T effector cells (40). In contrast, Th2 cells are thought to play a down-regulatory role in this response. WT and IL-13−/− mice were painted with DNFB on abdominal skin and then were challenged 5 days later by application of DNFB to the ears. As shown in Fig. 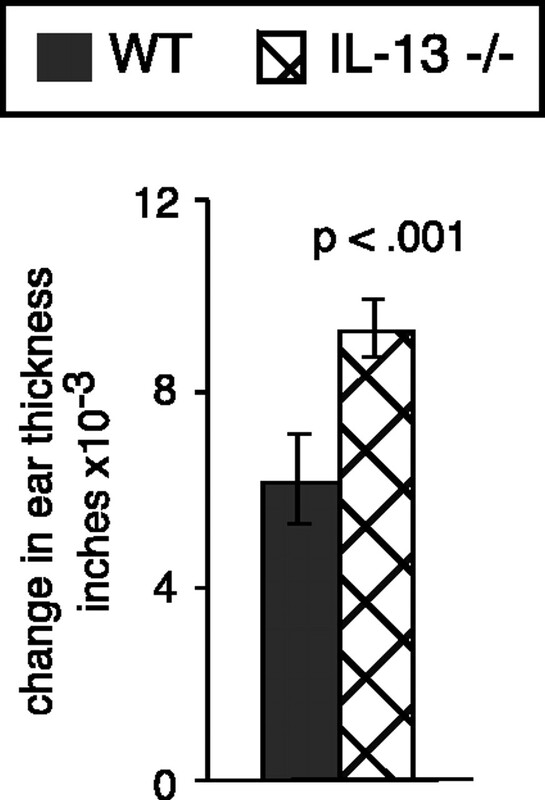 6⇓, IL-13−/− mice not only developed significant ear swelling responses after e.c. sensitization with DNFB, but these responses were even higher than those seen in WT mice (p < 0.001). Thus, there was no deficit in the ability of IL-13−/− mice to respond to an e.c. applied hapten. Furthermore, the increased ear swelling response seen in IL-13−/− mice could be explained by a lack of Th2-mediated suppression (40), further supporting a critical role for IL-13 in the generation of Th2 responses in the cutaneous microenvironment. IL-13−/− mice have no impairment in CHS to DNFB. Mice were painted with DNFB on abdominal skin and then challenged 5 days later by application of DNFB to the ears. Ear swelling at 24 h is shown. Data are reported as mean ± SEM of five to six mice per group (representative experiment, one of two with similar results). Statistical significance was determined by unpaired Student’s t test. The data presented here clearly demonstrate that IL-13 is the major cytokine involved in generation of Th2 responses in the cutaneous microenvironment. We have previously shown that e.c. induced Th2 responses to soluble protein can develop in the absence of IL-4, but not if both IL-4 and IL-13 are absent (34). The question that persisted, however, was whether IL-13 was simply able to replace the need for IL-4 in the genetically deficient IL-4−/− mice, or if IL-13 was required independently of IL-4. The results reported here, using mice deficient only in IL-13, conclusively show that IL-13 is necessary, not simply sufficient, for Th2 sensitization through the skin. Furthermore, this requirement for IL-13 appears to be specific to both the skin and Th2 activation. Identifying the critical factors involved in directing Th2 activation to soluble protein Ags encountered through the skin has obvious importance to the understanding of atopic disease. The hallmark of atopic individuals is their inherited predisposition to generate Th2-type immune responses to common environmental Ags. Although inhalational exposure is presumed to be the primary mode of sensitization to aeroallergens, the skin represents an additional important interface with the environment. In fact, atopic dermatitis patients are known to have defective skin barrier function, which could very well contribute to increased penetration of allergens (41, 42). As we and others have shown in mouse models, the predominant response generated by prolonged e.c. exposure of the skin to protein Ags is a highly skewed Th2 response (34, 43, 44). Likewise, contact-induced responses to protein Ags in humans, including latex hypersensitivity reactions and contact urticaria, also involve Th2 generation (45, 46, 47, 48). Given that the vast majority of children with atopic dermatitis eventually develop some form of allergic airway disease, it is plausible that penetration of environmental allergens through the skin could serve as a major mode of systemic Th2 sensitization in atopic individuals. Determining how these responses are generated and the immunoregulatory factors involved could lead to novel therapies aimed at preventing further systemic sensitization of atopic individuals. As stated above, the data presented in the current study attest to the importance of IL-13, as opposed to IL-4, in the generation of Th2 responses after e.c. exposure to protein Ag. Unlike IL-4−/− mice (34) (Fig. 1⇑), IL-13−/− mice that had been initially e.c. exposed to OVA and then challenged with i.n. OVA showed no significant inflammatory response in the lung (Fig. 2⇑, A and B). Others have reported that IL-13 can directly induce airway eosinophilia (11, 35). Therefore, we wanted to ensure that the absence of lung inflammation in e.c. sensitized IL-13−/− mice was not simply due to a lack of recruitment to the lung. Indeed, in the present study, IL-13−/− mice that had been sensitized with OVA i.p. did show defective recruitment of cells into the airway (Fig. 5⇑A). However, when histologic sections of lung were examined, it was clear that these mice were capable of mounting significant lung inflammatory responses (Fig. 5⇑B). These results, along with serum Ab levels equivalent to those of WT mice, confirmed that the IL-13−/− mice had been effectively sensitized i.p. This is consistent with previous studies by others showing that IL-13−/− mice are not impaired in Th2 generation after i.p. administration of Ag (32, 36). Furthermore, in addition to the lack of lung inflammation in e.c. sensitized IL-13−/− mice, both serum Ab (Fig. 2⇑C) and skin-draining LN cytokine production (Fig. 3⇑A) were also deficient. Thus, IL-13 appears to be required during the period of initial sensitization to Ag in the cutaneous microenvironment. Depletion of IL-13 by use of a soluble antagonist in WT mice also resulted in significantly decreased production of the Th2 cytokines IL-5 and IL-13 by skin-draining LN shortly after e.c. OVA exposure. This confirmed our findings in IL-13−/− mice and argued against any inherent defect in the ability of IL-13−/− mice to produce IL-4 as the explanation for our findings of decreased Th2 priming in these mice. Taken together, the data reported here indicate that IL-13 is necessary, not simply sufficient, for generation of Th2 responses to e.c. encountered protein Ags. IL-4 has long been recognized as a major inducer of naive T cell differentiation into Th2 effector cells. This is apparent from the numerous studies in IL-4−/− mice showing defective Th2 generation in response to immunization with protein Ag (49, 50, 51, 52). Similarly, we have shown that generation of Th2 responses by sensitization of mice with inhaled OVA is also highly dependent upon IL-4 (34). Thus, the IL-4-independent generation of Th2 responses after e.c. exposure to OVA described here and in our previous studies (34) appears to be relatively specific for priming in the cutaneous microenvironment. It is possible that the strict reliance upon IL-13, rather than IL-4, for Th2 generation in the cutaneous microenvironment reflects a relative deficit in IL-4 production in the skin, compared with other sites of sensitization. Alternatively, cells in the skin may be relatively more receptive to IL-13 than to IL-4. However, we are unaware of any studies demonstrating such differences. Along these lines, one intriguing connection between the cutaneous microenvironment and induction of Th2 responses is the IL-7-like cytokine thymic stromal lymphopoietin (TSLP) (53). TSLP is produced by epithelial cells and keratinocytes and is highly expressed in lesions of atopic dermatitis. In a recent report, Soumelis et al. (53) have shown that dendritic cells activated by TSLP will stimulate naive CD4+ T cells to differentiate in a Th2 direction, but with relatively higher production of IL-5 and IL-13 compared with IL-4. Thus, dendritic cells activated in the skin may be specifically geared to generate high IL-13-producing cells, which offers a possible explanation for the particular importance of IL-13, rather than IL-4, in priming Th2 responses in the cutaneous microenvironment. Similar to the e.c. induced Th2 responses to OVA described here, others have also reported Th2 responses that are more reliant upon IL-13 than IL-4. These include several models of pathogen-induced Th2 responses, particularly the well studied model of N. brasiliensis infection (27, 28, 29, 30, 31, 32, 33). It is clear that an effective Th2 response is required for expulsion of these worms and that such expulsion is more severely impaired in the absence of IL-13 than if mice are deficient in IL-4 alone. However, it is not clear whether the critical need for IL-13 is only at the effector stage, i.e., for clearing of worms from the gut, rather than during the initial priming stage. In other words, Th2 effectors making IL-4 and IL-5 may be generated, but are not sufficient to mediate worm expulsion. In contrast, we provide evidence in the present study that the absence of IL-13 interferes with initial priming to protein Ag in the cutaneous microenvironment, including decreases in both skin-draining LN cytokine production and serum Ab levels. One interesting possibility that would explain the similar dependence on IL-13 for generation of Th2 responses to experimental nematode infections is the fact that these pathogens are usually inoculated through the skin. In summary, the data presented in the current study identify IL-13 as the major cytokine affecting Th2 generation to e.c. encountered protein Ags. Given that IL-13 is highly expressed in the cutaneous lesions of atopic dermatitis patients, the skin may represent an important site of Th2 sensitization to aeroallergens in atopic individuals. We thank Dr. Debra Donaldson at Wyeth, Respiratory Disease, for providing the soluble IL-13Rα2-Fc fusion protein and Heather MacLeod, Patricia Ranney, and Katarina Serrano for technical assistance. ↵1 This work was supported by National Institutes of Health Grant R01-HL54450 (to K.B.). C.A.H. was supported by National Institutes of Health Grant K08-AI01848. ↵3 Abbreviations used in this paper: e.c., epicutaneous(ly); WT, wild type; CHS, contact hypersensitivity; DNFB, dinitrofluorobenzene; i.n., inhaled; BAL, bronchoalveolar lavage; LN, lymph node; TSLP, thymic stromal lymphopoietin.